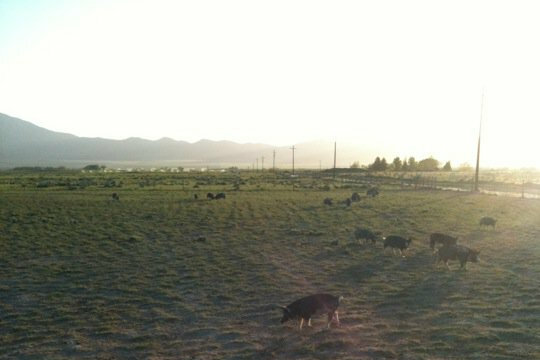 On a 20-acre parcel of land 30 miles south of Tooele, Utah, near the Sheeprock Mountains, is the Christiansen's Family Farm, better known as "Hog Heaven". During the warm months, owners Christian and Hollie Christiansen let the pigs feed on pasture. When winter comes, they use a hormone and antibiotics-free vegetarian mix of locally-grown grains and alfalfa. As it reads on their official blog, they "never feed pigs any animal by-products, old bread, slop, or anything of the like. We could certainly reduce our feed costs by using these things, but we would also lower the meat quality. Animal welfare and meat quality are two things we refuse to compromise on." The Christiansen's refuse to dock tails, clip teeth, or push their sows to produce more piglets than is healthy for them. "We take all the butchering hassles out of the equation, and it is a quick, humane kill," Christian told Desert News. Indeed, in an e-mail correspondence, Christian said he personally ensures the pigs are treated "properly" and "respectfully" until the end. The heaviest pigs are loaded up in a livestock trailer packed with hay bedding, water, and occasion treats, before they are shipped to the butcher, where they are eventually knocked unconscious on an individual basis with an electric prod before being killed. Christian said there's no thrashing or twitching, and he remains convinced the pigs are incapable of feeling anything in their incapacitated state. 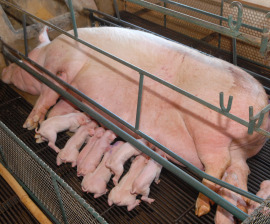 "A sow (mommy pig) is bred and often confined in a gestation crate. These crates are so confined that the sow cannot turn around or even take more than one step forward or backward. The reason they are kept this way is that when you cram this many animals under one roof, they get stressed. The stress causes the animals to start chewing on each others’ ears and tails etc… So sows are locked up “for their own safety and benefit”. Once they farrow (have a litter of piglets) they are allowed to nurse in farrowing crates for about 10-14 days at which point the piglets are taken away and the sow is bred again. As you can imagine this is very hard on the sow and they usually only live 2-3 years. Farrowing crates are like gestation crates except a section is added onto the side where the piglets stay. You see the focus of breeding has been for production and when mothering abilities started to deteriorate, pork producers began protecting the piglets from their mother stepping, crushing, or eating them with farrowing crates. When the piglets are born, they get their teeth clipped off, and tails docked. The runts are often killed the minute they are born and thrown in the compost pile since they are “inefficient”." The value of incremental progress in regard to animal welfare shouldn't be underestimated. Several years ago, activist Bruce Friedrich and author Peter Singer published an article on the subject, writing that they "understand the appeal of battle cries such as "not bigger cages, but empty cages.” But a bit of comfort and stimulation for an animal who will be in that cage her whole life is something worth fighting for, even as we demand empty cages. Not only is it the best thing for the animals in the cages, it’s also the best thing for animal liberation. It’s another stepping stone on the march." While it remains true that pigs in both the best and worst conditions will still ultimately be slaughtered in the end for human consumption, the efforts made by farms such as "Hog Heaven" to eliminate needless suffering ought to be commended as a step forward. If it's a choice between a sow being stuffed inside a tiny metal cage, unable to nurse her piglets, or a sow laying out in the open, happily tending her young (even though she will eventually be killed), I'd prefer the latter.